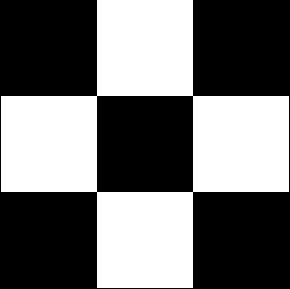 Change, a Four-in-Art Quilt | OccasionalPiece--Quilt! Posted on May 1, 2014 by Elizabeth E.
Yet most people think of this when I say hillside letters. . .
. . . but to me, neither of those counts. A letter needs to be embedded on a hillside or a mountain to count as a landmark. So that was the genesis of the quilt. 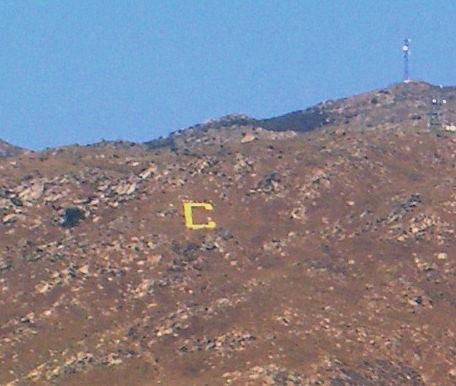 Our landmark hillside letter is a C, an imitation of that first University of California-Berkeley letter, which was set onto a hillside about 1905, the granddaddy of all the other mountain monograms. 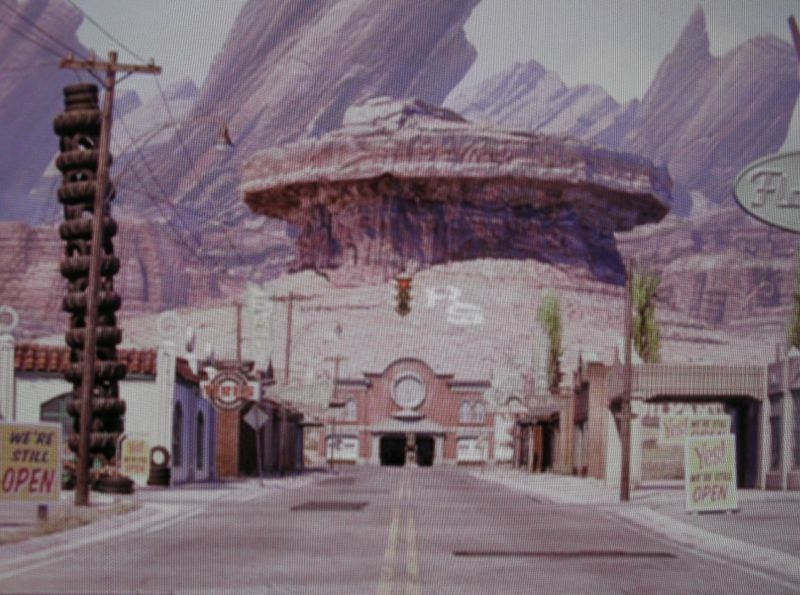 This is a blurry image from Wikipedia of our local mountain (our letter isn’t really yellow). I tried to photograph it, but couldn’t get a good vantage point, so this will have to do. What is the significance of these other letters, spelling out the word C-H-A-N-G-E? As Longfellow observed, “all things must change.” And I keep my mother’s advice that “A change is as good as a rest” close to my heart, for that’s a truth as well. But the C-for-Change linkage came to me one weary night, when I had to go and do one more pick-up and one more errand when teenaged children were still at home. 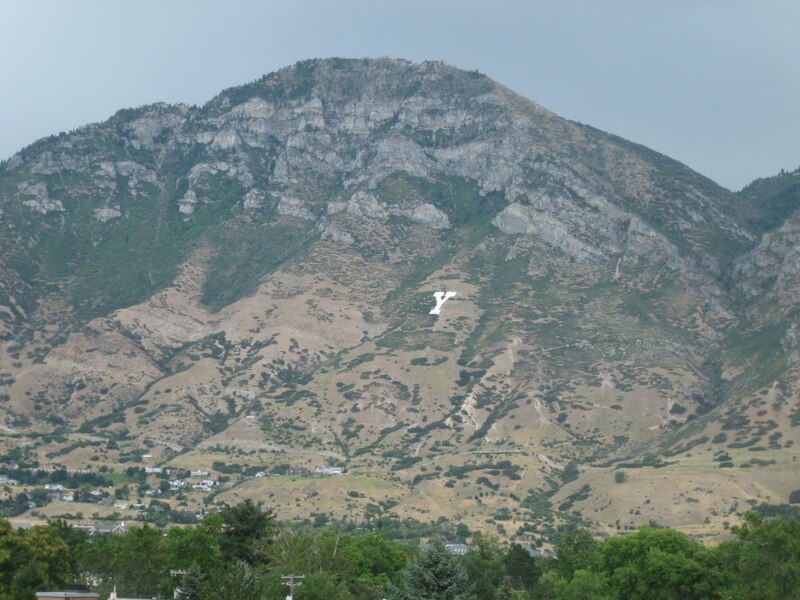 It must have been during our University’s Homecoming Week, for when I rounded the street corner at the base of the Box Springs mountain, I could see the “C” all lit up. I pulled over and gazed at the glowing letter with that tired-behind-the-back-of-the-eyes fatigue, wishing that that I could go home and be home, like I could when the children were little and weren’t off at some activity that required me to be out and about picking them up. I thought back to the “easy days” of tucking them in after a story and prayers and a drink, and about how wonderful those times were. Why did things always have to change? But I realized that change is the law of the universe, and instead of being at war with that constant mutability towards “something new, something strange” I should just accept it. Change and I are now uneasy companions. I know it won’t always be like that, for experience has taught me that change can come in steep cliffside drop-offs and hair-raising turns on a winding road. But for now, I’ll be content gazing at my quilt where it hangs in the corner of my kitchen. 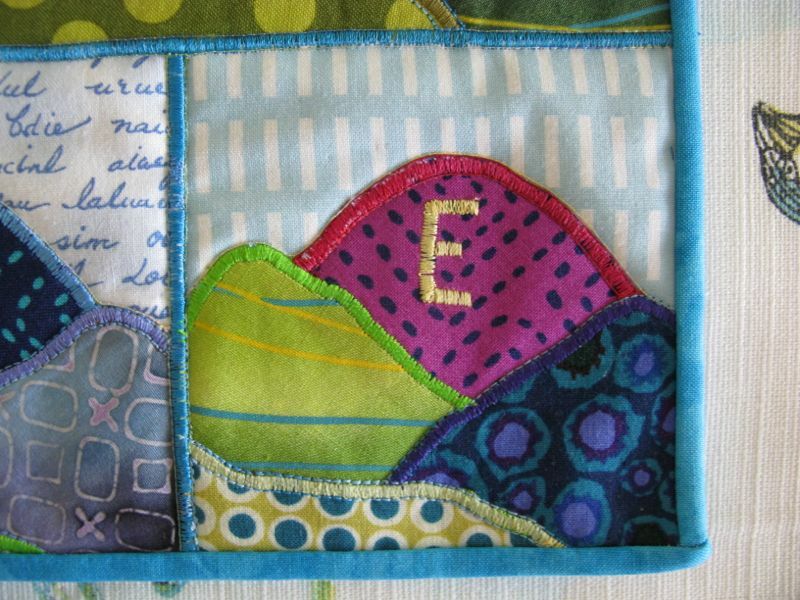 And come back for the next post, with instructions on how you can make your own little art quilt. 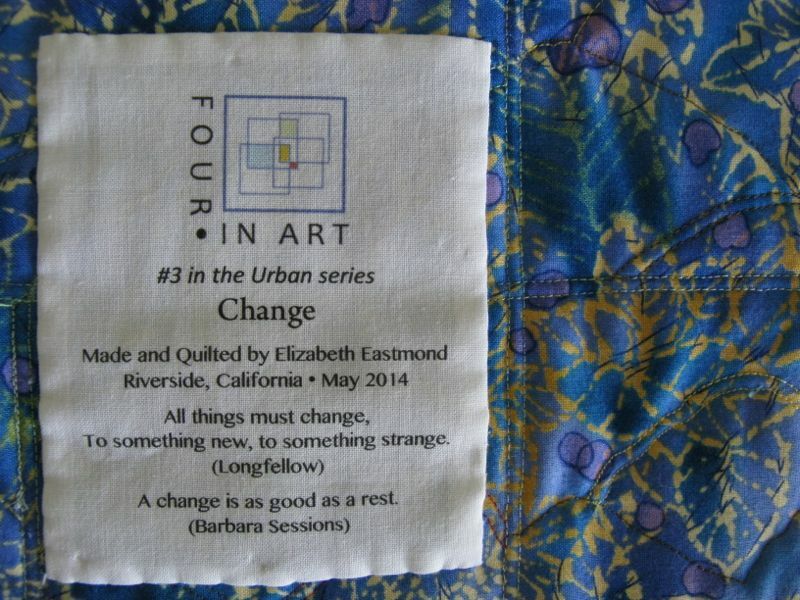 Elizabeth, what a delightful story and a wonderful little quilt! At first, I thought “oh my gosh – she got the theme wrong!”, but trust you to have such a unique spin on it! And nope, back East I can’t say we have mountains (or hills) with letters on them! Great post! All so true and the little art quilt is lovely too. Lovely against the yellow wall. I remember someone telling me, “If we don’t change, we die.” That’s a bit extreme, but maybe “wither” would be a good word to replace “die.” Nice post and fun quilt. So well said Elizabeth . . . change is not something that comes easy to me but I love how you have put the notion into words. 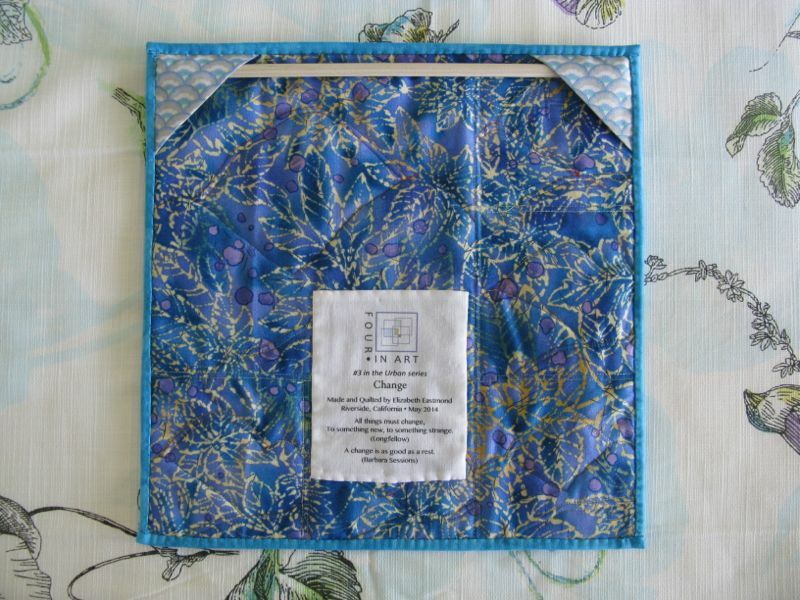 A very appropriate tie in to your quilt as well because changes in our lives really are emotional landmarks that signify important aspects of the time. Chnages can mark our lives in profound ways. Well done as always. I didn’t know that Cal’s Big C was the grandaddy! When I was there eons ago, repainting it was an annual ritual, with buckets of paint, and probably buckets of beer, carried up the hill. (I stayed home – it was a guy’s event.) Thanks for bringing back memories. I love your quilt. So many layers of meaning, I’m so impressed. Here in WI I don’t think we have any hills with letters, but it does seem to me that there are a couple in Iowa that I would see when visiting relatives, but they were laid out with rocks. 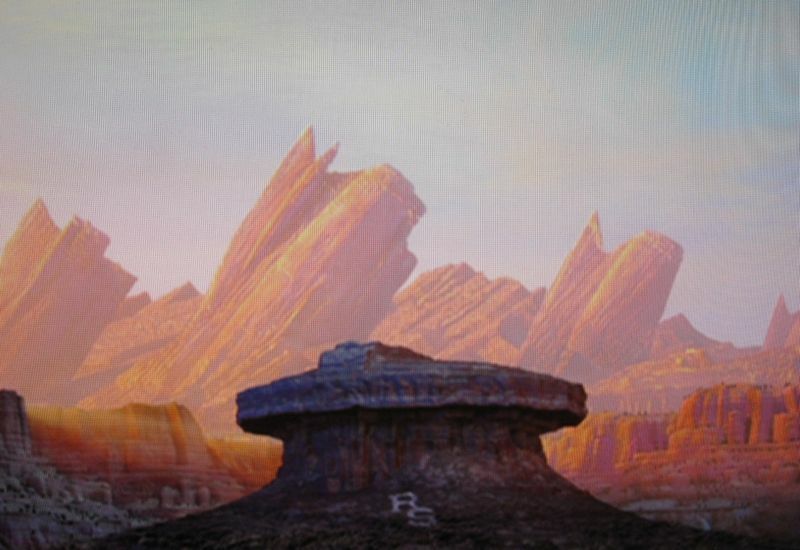 Loved the reference to the Cars movie, too. Change is hard, until it becomes the new normal, then we wonder why we complained so much in the first place! Great quilt as always, and definitely a unique one. Love it. Fascinating interpretation, as always. In the town where both sets of grandparents lived, about thirty miles from here (Reedley) is Smith Mountain, with a big S on it. Elizabeth, your art quilt is terrific! 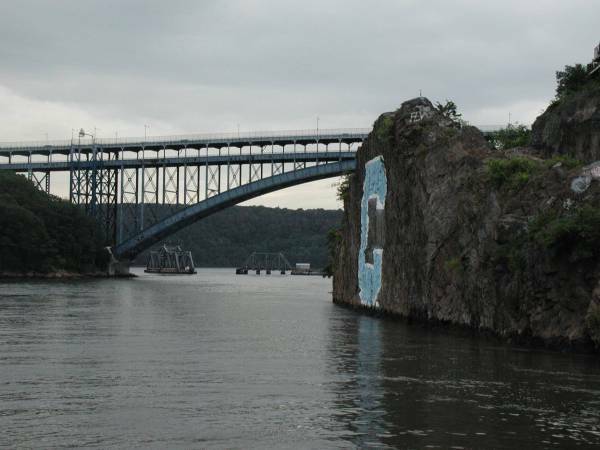 I love your post and how you incorporated the history of the mountain letters with your landmark theme as well as various thoughts on change. I am fascinated with your research of those letters. Growing up in the south and on the gulf coast, I saw no hills much less mountains. It wasn’t until a few years ago (and quite the grown up) that I saw the M on the mountains in Bozeman, Montana. When my sister flew out to visit us, I jokingly told her we had put the M up there to welcome here as her last name begins with an M! Thanks for sharing. Elizabeth, it is alway fun to read your posts and this one is no exception. I love how you have researched your inspiration so well and shared it with us all. Your ‘Change” quilt reminds me of the lyrics to a Mercy Me song that we exercise to in Jazzercise and I also heart on the radio. I also love the reminder of Mountain Monograms because that is something that I grew up with in Colorado as well! Love where you went with this theme. I guess I always assumed people put letters on their hills too. I’ve never lived around mountains, but hills in Canyon Lake, TX have a few letters/symbols. 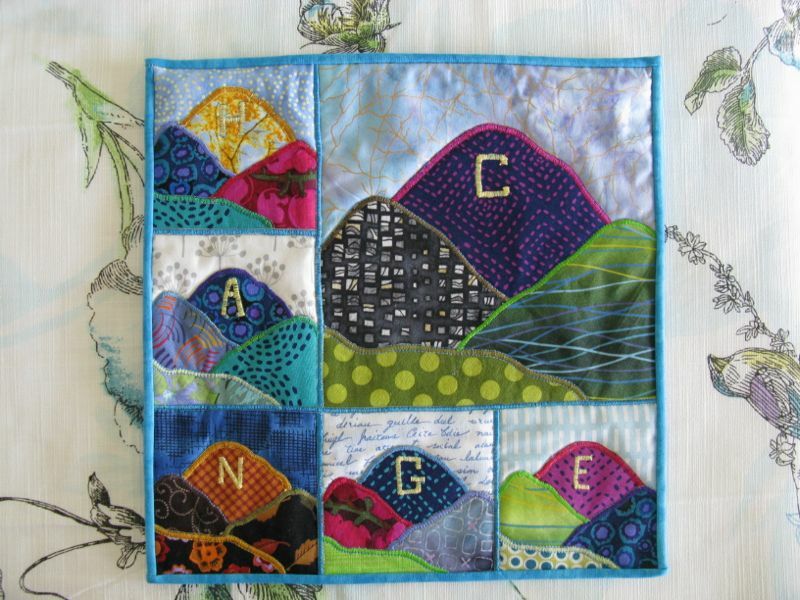 I love that you spelled out change while showing the landscape changing through your fabric choices, like seasons etc.. I like change…most of the time 🙂 Great job! I love your quilt and the story behind it. Change is interesting, and I love mountains. I am pretty sure that having letters on the mountains is illegal in Canada, however. How fun to see one that lit up every night. This is a great take on the theme, an unexpected turn, which I love. 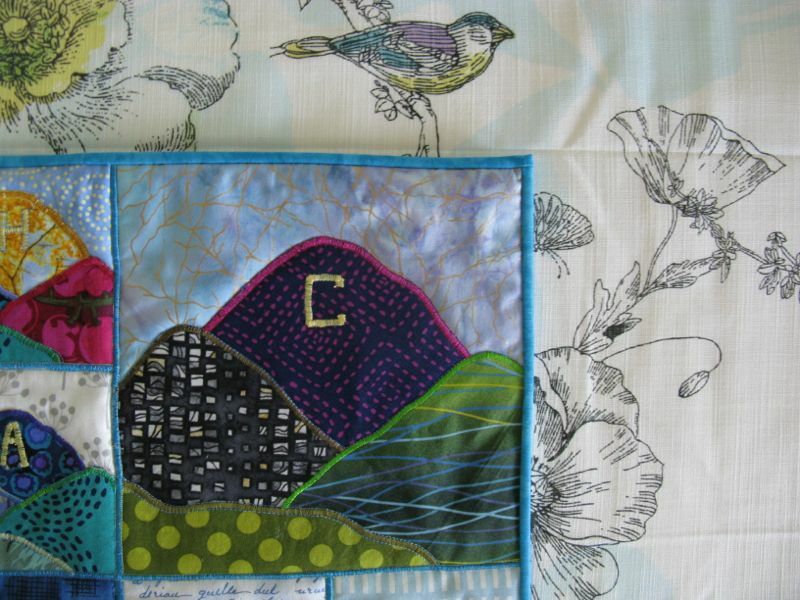 You do such a wonderful job with your quilts and explaining your interpretation of the themes. 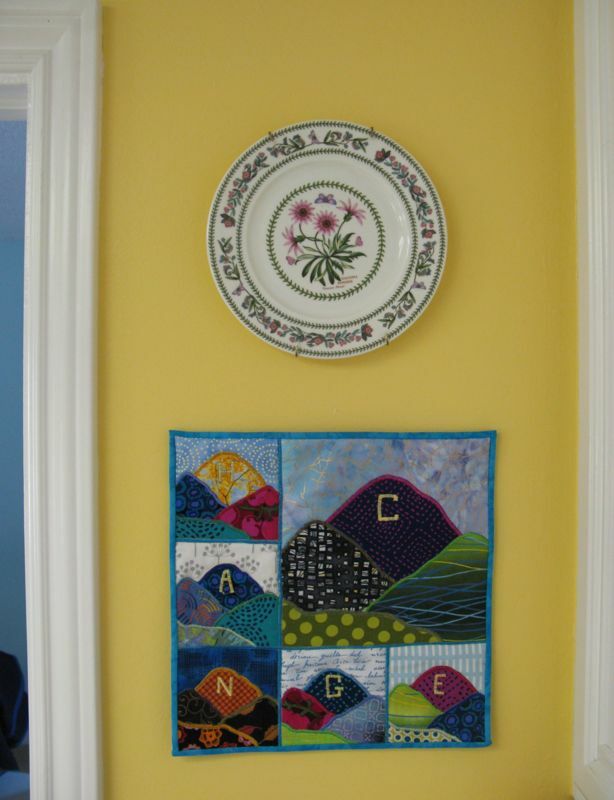 This quilt is great and it looks really nice on the yellow wall. Elizabeth…your story makes this little gem sooo special! Thank you for sharing. A friend just introduced me to your site. I had no idea there are mountains with letters. I grew up in what I consider the East (WV). There are mountains in the East, too. I grew up in the Appalachian Mountains. I’ve been to the Great Smoky Mountains. The Allegheny Mountains are close to the Appalachians. That’s just the ones close to where I grew up. 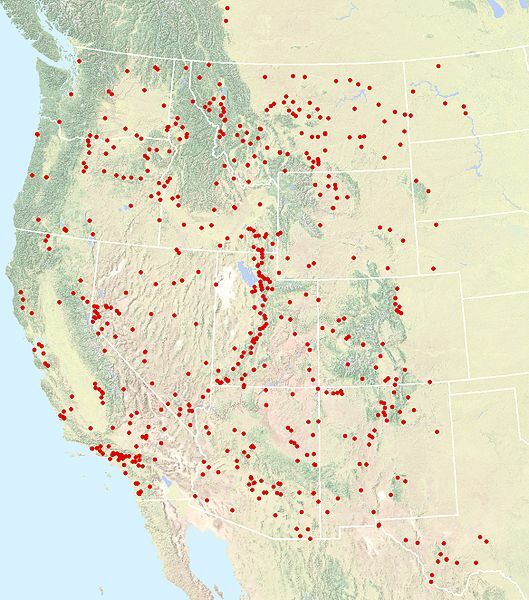 There are a plethora of mountains there and in my birth home area most of the state parks are in mountain ranges. Thank you for introducing us to the world of letters. Thanks for including your creative process. I took a grad class just a few years ago in creativity. I wish I had not been traveling with my work and had been quilting so I could have used that in my project. I am NOT much of a crocheter. I much prefer knitting. However, my daughter was in a sorority at OSU (Oklahoma) and I was taking the class through OSU – based in Tulsa. So, she and I drew out a design using some of the symbols of her sorority. I took that blanket with me on trips. I didn’t think I would get it done, so I cross stitched (yes, another craft I adore) a design by someone else of for her sorority and made it into a pillow with double ruffles. She gave it away when she left the sosority. She is not attached to material things as I am. She thought that ALL her t-shirts from sorority were gone. Nope, I have two big boxes. She lives in NM and was home about five years ago and found them in my “quilt” closet. So, now she wants a sorority t-shirt quilt. I found another of the cross-stitch pieces that I did of the pillow that is complete and I plan to use it on the back and maybe some quilt blocks. She wants only t-shirts on the front. So, I have a new project.